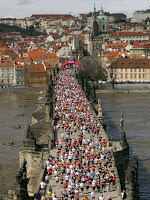 Plans are now underway for a group of Newfoundland runners to train for and travel to the Czech Republic for the Prague International Marathon May 11, 2008. If you are interested in being part of this marathon group (16 runners so far), please contact Joe Ryan at josryan@nl.rogers.com or Karen O’Neill at koneill@nlh.nl.ca . Optional weekend training runs start November 18 with the marathon training program beginning early January.